These 45 words describe five freedoms that are critical to our way of life. After you read the results of these surveys, you won't think I am just being obnoxious. 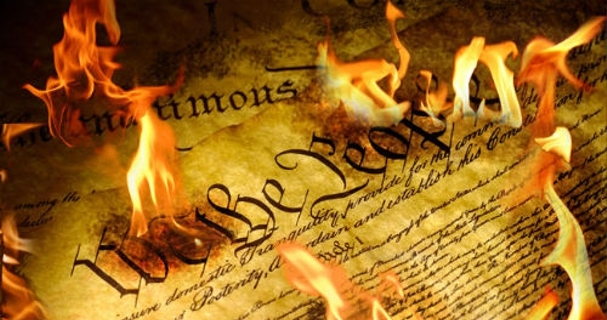 Survey Shows 1 in 5 Americans thing the First Amendment gives us too many rights. Two New Surveys Reveal Concerning Trends for Religious Freedom in the U.S.
And these articles were from last year! DePaul University recently banned the use of chalk on sidewalks after some students objected to some pro-Trump slogans Donald Trump supporters wrote on the sidewalk. Really? That is typical of what is going on at college campuses this year. In March of this year, The Atlantic published an article about the threat to free speech on campuses. Don't roll your eyes. It was entitled, "The Glaring Evidence That Free Speech is Threatened on Campus." A few days ago, it published another one, called "The Chilling Effects of Fear At America's Colleges "
What do you think about the First Amendment? Is the Constitution really "just a g-d piece of paper," as George W. Bush once famously said? This is a free speech zone. I welcome your comments, as long as there is some evidence you actually read some of the source material here or otherwise educated yourself on the issue. And that they don't include violence, rioting and looting. Or name calling and bullying.